In our world obsessed with constant competition, placement, and proper development, testing has becoming a very common procedure. We have tests designed to determine how intelligent we are, as well as tests that group students together in classes that are within their mental capacity. We also have tests that tell us which jobs would be best for us, and we even have tests that claim to reveal our personalities. Chances are you've encountered at least one of these types of tests at some point in your life, but have you ever wondered where these tests come from and who designs them? Psychometrics is the science of measuring people's mental capacities and thought processes through a systemized manner. In other words, it’s a way to create tests to determine how smart we are or what are personalities are like. Psychometricians are the scientists behind those interesting - and sometimes nerve wracking - aptitude and personality tests. The tests that these professionals create help to better understand how the mind works. They are able to measure the how a mind functions and how it compares to other groups of people. Alfred Binet was one of the first and most recognizable people to come up with the idea of a workable intelligence scale. He worked to help create the Binet-Simon Intelligence test in 1908, which was one of the first tests used to measure a person's intelligence. Later, in 1916, this test was improved upon by Lewis Terman, a professor at Stanford University, and it was called the Stanford-Binet Intelligence (IQ) Test. Throughout the years, the original intelligence test has been changed slightly and adapted throughout the years. Today, this test is still used to measure a person's IQ, or how smart he is compared to his peers. Other tests have also been created, which can measure everything from a person's personality traits to what type of career he would excel at. What Types of Tests Do Psychometricians Create? In general, there are two main types of tests that psychometricians might help to create. The first types of tests are aptitude tests. These measure people's knowledge and reasoning in areas such as language, mathematics, patterns, and spatial awareness. After a person takes an aptitude test, his raw score is figured based on how many answers he got right and wrong. This raw score can then be examined next to the raw scores of other individuals in a certain group of people. A person's raw score from an IQ test, for instance, can be compared to the raw scores of others in his age group. The average IQ for most age groups is usually between 90 and 110. Personality tests might also be created by psychometricians. As their name suggests, these types of tests help measure and reveal certain parts of a person's personality. Questions on these types of tests usually ask about certain situations, and how a person feels about them or would handle them. 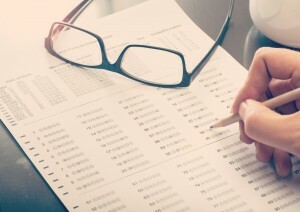 Unlike aptitude tests, there are no right or wrong answers on these tests. Rather the answers that a person gives are compared to certain personality traits, and the dominate trait are picked out and revealed. What Does a Psychometrician Do? Research is a large part of a psychometrician career. These professionals will spend a great deal of time gathering data and calculating statistics from that data. Psychometricians are also responsible for determining the reliability of certain tests as well. After the tests are created, psychometricians might also administer the tests, since they are familiar with them and understand how they work and how they should be administered. Once the tests have been completed by the test takers, psychometricians will then score them. The results of the tests can be compiled into reports or they can be compared to other groups of test takers. For instance, let's say someone takes an IQ test and scores 140. By comparing that score to the scores of other people in the same age group, a psychometrician would be able to deduce that that person is highly intelligent. Evaluating current tests and testing systems to ensure accuracy might also be in a psychometrician's job description. After determining the accuracy of tests, these professionals might make changes that will make them more accurate or effective. Where Does a Psychometrician Work? Psychometricians might work at research facilities, testing companies, and universities, performing research and creating tests. Hospitals, mental health clinics, social service offices, and private psychological practices might also hire psychometricians. Companies and corporations also seek the expertise of psychometricians to create and administer aptitude and competency tests, as do many public and private schools. The military uses tests created by psychometricians to test the intelligence and mental stability of new recruits, and criminal justice facilities also use similar tests to research the mental state of criminals and inmates. What Are the Education Requirements to Become a Psychometrician? It may be difficult to find schools that offer undergraduate degree programs in psychometrics. Therefore, many individuals who are starting a career in this field will earn degrees in closely related areas, such as psychology or statistics. Graduate degrees in psychometrics, psychology, statistics, or testing methodology can also be helpful when pursuing a career in psychometrics. Find schools in your area that offer Master's Programs and Doctoral Programs in this degree field. Read more about psychometrics degrees. What Is the Median Salary of a Psychometrician? The Bureau of Labor Statistics does not collect specific salary data for psychometricians. Statisticians, however, earned a median salary of $72,830 in 2010. This is right in line with a report done by the Bureau of Labor Statistics in 2011, which states that psychometricians made between $50,000 and $100,000 each year. Alfred Binet created the first test to measure IQ, named the Binet-Simon Intelligence test, which was originally used on children. Lewis Termin later adapted and revised this test to measure adults' IQ's.